What will David Robertson do with his qualifying offer? 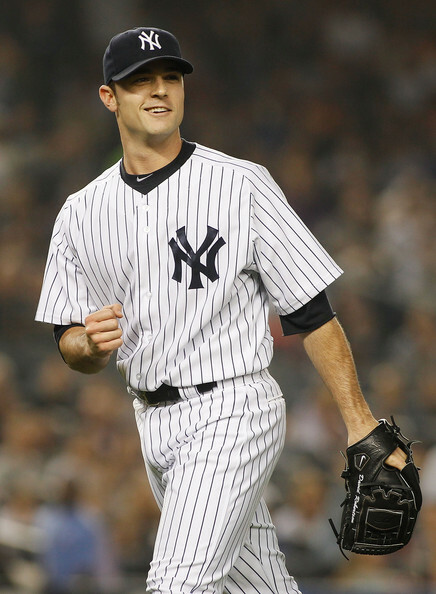 This time last year we were all asking ourselves – Is David Robertson capable of taking over for Mariano Rivera? The answer was a resounding yes. Now it’s time for Robertson to cash in on his success. What amazed me most was just how quietly Robertson accomplished this feat. There is no team in all of professional sports that puts more pressure on their players than the New York Yankees. Yet Robertson didn’t falter when it was his turn to step into the spotlight and put together a successful first season in the closer role. Robertson earned 39 saves with a 3.08 era in 2014. His walk ratio, which is something that had been a problem earlier in his career, saw a slight rise but has been mostly stable for the past three years now. He also saw a rise in his strikeout ratio, 13.4 per nine innings, a very solid number that you look for in closers. Earlier this week was the deadline for teams to make their qualifying offers to pending free agents. It was questionable as to what the Yankees were going to do with Robertson. Despite his strong season, the Yankees do have a young Dellin Betances to fall back on. The rookie right-hander took the league by storm and has the makings of becoming a closer one day. But the Yankees decided to make Robertson that 1-year $15.3 million qualifying offer, meaning they might not be ready just yet to thrust Betances into that role. However, because of this qualifying offer teams that seek Robertson will have to surrender their first round pick, unless they were among the leagues worst records last season, to sign him this offseason. With the heavy influx of ‘Moneyball’ like philosophies among baseball front offices these days, more and more teams are unwilling to part with these treasured draft picks. This could cause a problem for Robertson to get the most out of his suitors. Which is also why the Yankees made this offer to begin with. I’m sure they wouldn’t mind at all if he accepts the offer. Sure he will be overpaid, but the Yankees have the money to give. More importantly is that if he declines, the Yankees will receive a much sought after early round draft pick. Robertson, who will turn 30 right around opening day next season, could be in good position to cash in on his remaining prime years. He is still young enough to attract a long-term deal and his stat line puts him among the game’s top closers. Santiago Casilla, Koji Uehara, Sergio Romo and Jason Motte were the closers on the last four World Series champions. They have something in common. None was the ninth-inning man when the season began (Sherman, NY Post Nov. 2014). Although it is hard to argue that track record, I think more often than not teams would like to have the closer role solidified early on rather than sorting that out during the season. There are plenty of teams out there who are in need of a closer, some of which might feel that is the missing piece to making them a serious contender. We don’t have to look any further than within the division for potential suitors as The Orioles and Blue Jays could benefit from the addition of Robertson. Then you have a team in the Tigers who have been trying to solve their bullpen problems for a few years now. How about the World Series Champion Giants? They steered clear of using their closer, Casilla, in the playoffs and could use an experienced arm in that pen. Don’t sleep on the Chicago Cubs who have openly stated that they will be a serious players in the free agent market. Last but not least, don’t sleep on the Yankees. Just because they made a qualifying offer doesn’t mean they won’t try to work out a long term deal of their own. I would be surprised if Brian Cashman didn’t try to work out a team friendly extension. At the end of the day, I think Robertson will decline his qualifying offer from the Yankees. Sure the $15.3 million is a hard payday to pass up – but a long-term deal is more appealing. If he chooses to stay with the Yankees, he risks the chance that one bad stretch next season could cost him his job to Betances who will be waiting in the wings. Robertson won’t be getting any a $15 million a year offers, but I do think he will attract a Papelbon 4/$50 million range type of contract elsewhere. Unless the Yankees make a solid extension offer of their own, I expect Robertson to explore his options. Why did the Mets let George Greer leave?